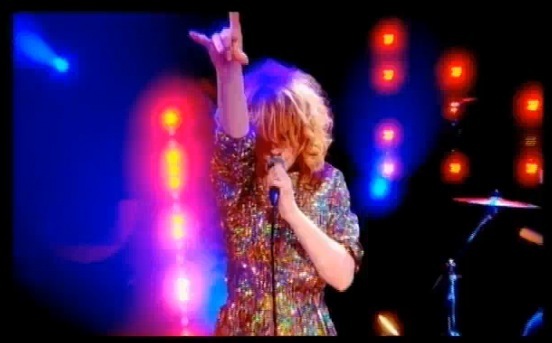 Goldfrapp appeared on UK program Friday Night With Jonathan Ross last night to perform "Rocket," and Alison looked and sounded amazing. I think it's safe to say this more than makes up for what we'll just call The Italian Incident from earlier this week. I am completely addicted to new album Head First—and brava to it doing well here in the States! Billboard pointed out that it's off to a "notable start" ahead of next week's chart. P.S. Read my interview with Alison Goldfrapp yet? It's good, I promise. yes yes that's all well and good, but also the new Doctor Who was on!!! YAY! LOVE it! I'm still warming to the new album but this song and performance are perfection. Excellent video because I like the way that woman manage her fans and the way she moves over the stage, I think I'd be totally encouraged by her to do whatever thing she wanting.